* Just as Guerlain has a dandy fragrance under the name Arsene Lupin, Nasomatto was inspired by a 19th centry dandy. * The fragrance kicks off with a chocolate and floral note. The chocolate is like baker’s chocolate – rich and unsweetened, spiced with a touch of cloves. * I think the Guerlain reference is in my head because it reminds me a lot of one of my favorite fragrances, Guerlain L’instant Extreme (with its rich dark chocolate scent that evolves over time). * The chocolate stays in the forefront and a clean, non-skanky oud note starts to come up. The oud starts off muted but gradually comes in to play a nice harmony with the chocolate. * Longevity is really nice as eight hours after applying, the wonderful base of amber and balsams come in to join the chocolate and oud. Summary: Nasomatto is known for strong and intense fragrances (Black Afgano, Duro), so Pardon comes off a little more refined. That being said, it definitely does have personality and broadcasts a bit in the beginning. If you are looking to enter the world of oud but don’t want to get too crazy – this would be a great introduction. This would also work for those who want something that is office safe but still has some power to it. 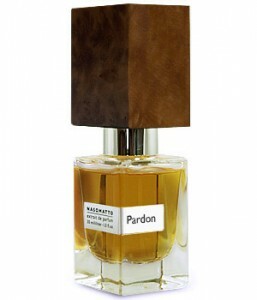 Nasomatto fragrances are available from Barneys New York, Luckyscent and independent boutiques.